Reviewing and Rating The Best and Worse Ghost Tours Of Texas. Listed and rated below are some of the best Texas Haunted paranomal active hotspots you could ever visit. Please use my rating guide to discover for yourself these great Texas haunted ghost town tours worth taking. And also be aware that all tours sometimes do not live up to their real haunted reputations. Some might be over rated or just not up to parr. Seasonal Halloween ghost tours often are thrown together in a very rushed last minute manner and often or not worth openly rating. Halloween only Texas ghost tours - That is if they are not the shinning great ghost tour that haunts the city streets all year long. Often some of these tours are rather well worth the admission fee but or only offered at special times of the year. Unless one of these tours is exceptional I will not bore you with a rating of such tours. I believe my ratings are more then fair and have also questioned others who have taken these tours to make my personal assessments. The following review represents the sole views of the author only THAT OF LISA LEE HARP WAUGH. The opinions are those of the author alone and do not represent the views of any other party or of this web site. I judge my ratings by the Ghost Tour guides ability to capture and hold my attention. I also poll the people in attendance and locals in each city before making a final judgment in awarding the rating I give the actual tour in general. 1 Skull- Don't bother! Don't take this tour unless it's the only one in town. 2 Skulls-Catches your attention but never really keeps it. 4 Skulls- Great ghost tour - Don't miss it EVER! A perfect blend of history mystery and spooks"Simply The Best Ghost Tour Experience!" Photo above Lisa Lee Harp Waugh and her lovely well educated daughter Mallory, both sharing a moment on a Ghost Tour in Texas. There are many great ghost tours across America an around the world and in the Great haunted State of Texas. Some just tend to pop up around Halloween while others spook the daylights out of us 365 days a year. And whilst visiting different cities around the world they to often might surprise you when comes to how haunted they really are. Of course the Great state of Texas is no exception. Reviewing ghost tours is one of my favorite past times. Not only do I learn about the spooks and shades that haunt our world but I also get to meet many interesting haunted individuals along the way. From the likes of Dash Beardsley the great one and only Texas Ghostman. And he Best Texas ghost story author the great man himself Mitchel Whitington. Or the best real number one ghost hunter in Texas to actual ghost touring people who are therejust to be curious about what the paranormal world has to offer. Rating the real ghost tours of Texas. If there is the ideal ghost tour guide in Texas, then of course it is Dash Beardsley. A captivating speaker who draws you into the world of the dead that haunt the shores of Galveston Island. Beardsley is a master story teller. He has that personal charm and charisma that makes you become part of the story. I can only suggest to all those that give real ghost tours that, Dash Berdsley is the man to emulate. His skills of presentation and historical knowledge of the local ghosts stories and urban legends is more themnimpressive. If you are going to have an encounter with a real Texas ghost, it is most likely going to actually happen on this tour. Skeptics beware! Founded in 1999 by Ghost Tours Of Galveston Creator Dash Beardsley, Ghost Tours of Galveston IS Galveston Island's first, foremost, and original haunted historical walking tour. This unique two hour tour combines history, mystery, ghost stories and legends taking you on a journey into Galveston's richly unknown past. The Great Storm of 1900hurricane and the American Civil War Battle Of Galveston have left their rich haunted mark stained upon the white beaches of the Gulf shores. Voted by Reader submissions as one of "The Best or Most haunted Ghost Tour in America for you to take and to investigate. Haunted America Tours 2004- 2009. Americas' Best Haunted Ghost Tours in the United States. Please take some time to stop at The Ghost Tours of Galveston's Online Shopping. Books, Clothing, DVD"s and Real Ghost Hunting Equipment Visit Here Now! PARANORMAL NEWS FROM HAUNTED AMERICA TOURS... STRANGE WEIRD NEWS STORIES FROM THE HEADLINES, PLEASE VISIT HERE. Dash beardsley is an exciting individual to meet. The man is a wealth of information when it comes to the history and mystery that is haunted Galveston Island. No trip to the Island is complete with out meeting him and taking one of his many great tours. These fantastic ghost tours that Beardsley offers are given year round. If there is a must do and don't miss ghost Tour, certainly this is the one! The ultimate private paranormal investigation with Dash Beardsley founder/creator of Ghost Tours of Galveston and the new "Secret Society Cemetery Tour" will be conducting a Ghost Hunt with members of Texas Society of Paranormal Investigations on Halloween night at 12:00 midnight.This will be conducted at an undisclosed location to be announced.If you have interest in this event the cost is $35.00 per person. Please contact the office for your reservation. Enjoy a great night of excitement and spirits with the Ghostman of Galveston. The real haunted Ghost Face on the building in Galveston, Texas. located at the UT Medical School building. It's at 4th street and Harborside Drive in Galveston, right by the Medical school. Visit Galveston's' most "Secret Society" of "Dead" history. The famous and the infamous of Galveston's' past rest at "The Old City Cemetery", a conglomerate of seven cemeteries that grew together over decades of time and tempests,since Galveston's' very inception. Also the Halloween season. This will be a year round tour as is our current ghost tour of the Strand district is today. Check our site or email for upcoming schedule for our brand new tour. I really enjoyed this tour and want to recommend to all who visit the haunted City of Jefferson, Texas. In my opinion this is the best and most haunted hotspot in the entire town. Yes this is the must do haunted house ghost tour in Texas, you could every venture to take. Want to hear the latest ghostly goings-on at The Grove every month? It's easy, secure, and best of all, FREE! Sign up for the GroveZine for a hauntingly good time every month - just check out some of the back issues in the archive by clicking here. The Grove, a historic property in Jefferson, Texas. The Grove is a private residence and tour home in the old Stephen Smith Land Grant section of town. The house was built in 1861 by Frank and Minerva Stilley. It had one structural change in 1870, the addition of a room to join the detached kitchen to the house, and another change in the 1930's when an indoor bathroom was added and the side porch enclosed. Other than that, the house stands pretty much as it did back in 1861. The house is listed on the National Register of Historic Places by the National Parks Service, and has been designated a Recorded Texas Historic Landmark by the Texas Historical Commission. The house has been said to be one of the most haunted locations in the Lone Star State. The ghost stories go back over 100 years at this 1861 home, and the first indication that something odd might be happening there was in 1882 when a man named T.C. Burke purchased the home. He moved his family in, and had left within a month's time; the only explanation was, "We can’t live there..."
Prominent spirits are a lady in a white dress that always takes the same path through the house when she appears, a man in the garden who is often seen striding through the Lily beds as if late for an appointment, and a mischievous entity in the den that seems to be particular fond of the ladies. Join us for an hour-long excursion into the historic old home that has been called "the most haunted house in Jefferson". You`ll hear the fascinating history of this 1861 house, along with the true supernatural experiences of the owners. Walk the gardens, sit in the front parlor, and follow the footsteps of the mysterious Lady in White. Please call for tour time and information. No children under 8 years of age, please. I certainly recommend this Haunted excursion into the world of the unknown. Yesit is a real fun ghost tour and worth more then just the fee to take it. Alamo City Ghost Tours offers a daily day and night ghost hunt in downtown San Antonio. The Alamo Ghost Hunt Tour, our evening tour, was the most broadcasted Ghost Tour in San Antonio We visit 13 haunted locations, starting beside the outside wall of the Ripley's Believe It or Not! The address is 307 Alamo Plaza. The hardest thing about taking our tours is not being fooled into getting on the wrong tour You will see two of the cities Oldest Hanging Trees, an Old Spanish Palace, Battlefields, Old Hotels, Cemeteries and the Alamo Plaza Area. We bring ghost-hunting equipment for people to use so the whole crowd can have a ghost hunting experience while hearing about the ghost. We have been leading Ghost Hunters through San Antonio's Most Haunted Locations since 1996. Knowledgeable guides, historical accuracy and a Top Notch Reputation is what has put us at the top of San Antonio's Best Entertainment List for the last 5 years. Yes this is the premiere ghost tour to take when in San Antonio. A wonderful enlightening tour that leaves you wanting more! aAnd to me that's the best real ghost tour to take! Look for the park benches located next to the covered gazebo. The guides will be waiting for you! More than just a ghost tour! Join a ghost hunt every night as folklore and history come alive! The journey begins at 9:00 PM in Alamo Plaza located across from The Menger Hotel. Embark on an authentic journey to some of the most famous haunted sites in San Antonio! Everyone attending receives equipment to use throughout the duration of this 1 hour 30 minute ghost hunt. We'll show you the latest and never before seen equipment used to detect ghost. Walk the shadowy streets of down town San Antonio covering over 10 locations with proven ghost activity. Use the latest in modern ghost hunting equipment as seen on the television shows Ghost Hunters, Ghost Hunters International, A Haunting, and Paranormal State just to name a few. Hunt for the restless spirits of San Antonio's past while seeing evidence of the ghosts who continue to haunt the San Antonio area! Learn about the difference in ghosts, hauntings and the factual accounts of their death. Ghost Hunts of San Antonio Texas Tour cannot promise that you will experience ghosts on your journey however; many mysterious anomalies have been spotted and photographed by attendees. We can promise that the journey will leave you mystified! A wonderfully well executed ghost tour. My only disappointment was it seemed to be a little to historical and not so ghost focused only at few spots. Austin Ghost Tours has extensively researched Austin and Texas history so that they may tell the real stories of the people, places and events in Austin's past. Each tour highlights different haunted areas and exposes the ghosts stories of the past and present. Disclaimer: The halloween special tour is taken at tourists own risks. Austin Ghost Tours accepts no responsibility for personal injury, or harm of any nature and reserve the right at all times to refuse admission or cancel a tour. By attending the halloween special tour, you confirm that you are of suitable mental and physical health. Beginning October 2nd and disappearing after October 31st, Austin Ghosts Tours presents the 2009 October Special Edition Halloween Tour - 90 minute downtown walking tour taking place throughout October. Discover the ghosts that linger and the disembodied souls that roam the darkened streets and alleyways of downtown Austin; new stories and traditional favorites. Take the 2009 October Special Edition Halloween Austin Ghost Tour and quench your desire to learn all there is about ghosts in Austin and... Beyond! Check website for dates and departure times. Uploaded by blightproductions. - Explore new destinations and travel videos. Our tour guide seemed to be pre occupied with personal matters and not able to actually convey a good scary ghost tale. It seemed always sounding like she was reading something in a monotone voice and never broke from character. Not only did the tour seem to, too scripted, it did not make myself or others on the actual tour feel like anything but as if we were attending a long boring lecture. But in the same vein it seemed very overly rushed. The way she rushed it seemed like she had to get the tour over quick because it was church baking night. I would love to reassess this tour one day. But not to soon. It really made me feel talked down to. This ghost tour it left me feeling like why did I take it in the first place. Historian Jodi Breckenridge in Jefferson Texas founded this ghost tour. She states on her web site that it is considered the most haunted small town in Texas thanks to Discover,Travel and Scifi channels. Not that anyone really considers their choices to be 100% accurate anyway. This actual tour to me and those that were on it with me, felt that it fell rather flat. As our guide seemed to run through what seemed and overly rushed, and to overly rehearsed script. It made us all want to go to Annie Skinners, just to deal with the real spirits and to forget the frighteningly horror of a a tour we had just been on. Or perhaps it was that the hype was too overrated? Or maybe I just took the tour on a bad night for her. Not to just say this tour is stale or the presentation is actually lacking. Personally this tour disappointed me to the point of distraction. Though on the other hand my daughter Mallory loves taking this great Texas ghost tour, and she recommends it highly! Take a virtual tour of the Historic Jefferson Ghost Walk. Come join us on a night time journey and discover Jefferson's Historic Haunts. By the glow of lantern light you will venture through dark alleyways and courtyards listening to vivid accounts of historic tragedy, murder and ghostly encounters. You might even experience one! The only tour in town that will take you inside of a haunted location! Disclaimer: The Historic Jefferson Ghost Walk IS NOT affiliated with any other ghost tours in town. This is a very well put together ghost tour. Informative and spooky to say the least. 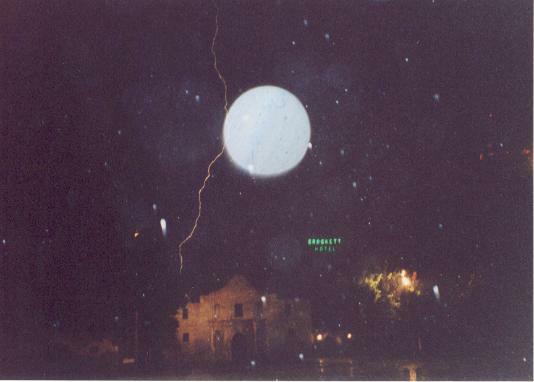 "The Ghost Capitol of Texas"
This is a wonderful ghost tour and not worth missing. Not only is it informative but more then just paranomally entertaining. years with internationally recognized ghost hunter Martin Leal. hunting at the Alamo with professional ghost hunting equipment. tour customers see full body apparitions on a regular basis. Lisa Lee Harp Waugh and Drew looking for a spirit or two outside of Cooter's Liquors store in Highway 59 in Jefferson Texas. COME BACK SOON FOR MORE TEXAS GHOST TOUR RATINGS COMING SOON! 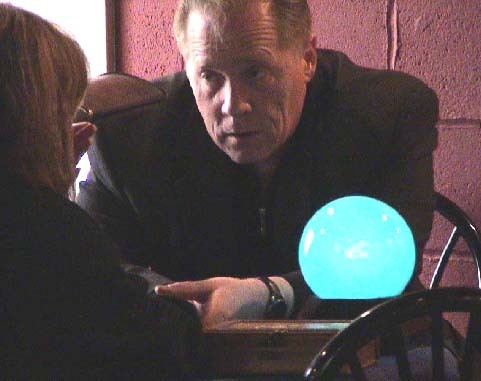 WE BET YOU DON'T KNOW WHO THE REAL TOP TEN BEST AND MOST LISTENED TOO PARANORMAL TALK RADIO SHOWS ARE FDO YOU?